American DJ Light Copilot III Analog Chase Controller System DJParts - All Variety of Parts that DJ Needs. 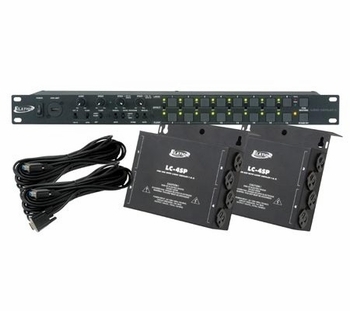 LC-4SP SPECIFICATIONS: • Compact 4-Channel Power Pack (proprietary for Light Copilot I & Light Copilot II) • 2x 3-pong Edison plugs per channel (8 total plugs) • 9-pin In & Out connectors to daisy chain to other LC-4SP power packs • Daisy chain output selector (Ch. 1-4 or Ch. 5-8) • Changeable hanging bracket to hang on truss • Max Power: 15A Total, 10A per channel • 15A circuit breaker • Dimensions (LxWxH): 7” x 7” x 2.5” / 180x177x64mm • Weight: 4 lbs./1.8 kgs.